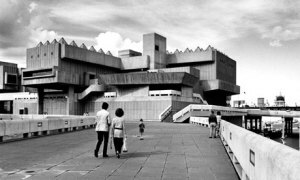 The Southbank’s utopian public spaces, as completed in 1968. Looking East towards The Hayward Gallery. St Pauls Cathedral in the distance. Today, just outside the Southbank’s Hayward Gallery, and as part of the ‘Mirror City – London Artists On Fiction And Reality’ exhibition, London-based art group Lucky PDF have parked a VW Transporter van with a large LG screen installed and the side door thrown wide open. Anyone can enter, sit, and watch their video ‘How To Leave London’ (2014) without paying the entrance fee for the rest of the show. Thus Lucky PDF nimbly operate as part of a major institutional exhibition while remaining marginal to it.